Kalinda's husband, Anton, stood in the night air, just outside the house. It was the end of a long day at work, capped by a family dinner. The children were in bed, and Anton and Kalinda prepared for their nightly respite. Enjoying one last moment under the starry sky, Anton suddenly felt faint. He crumpled to the ground, his life extinguished by cardiac arrest. Kalinda was devastated. She grieved for her beloved husband. Heartache gave way to fear. Without her husband—the sole bread winner of their poor family—how were she and her children possibly going to survive? Life insurance and a savings account were things this poor family couldn't even think about. They only had the means for day-to-day living. While Anton had managed to provide for their food and children's schooling, these two basic commodities were now at risk. Kalinda soon found herself in the same situation that many impoverished families around the world are in. Often having to choose between food or education, families are left to trade in their children's futures just to make it through today. Without education, the children of these families become shackled by the poverty they grew up in. Kalinda, unwilling to sacrifice her children's future, desperately sought employment. Many women in Asia feel trapped and helpless because of seemingly inescapable poverty, just like Kalinda (not pictured) felt. Most poor single parents like Kalinda work as daily laborers and augment their meager income by growing their own food for survival. This practice, known as subsistence farming, is a cost-effective way for poor families to secure a daily meal. It costs very little money but requires tools and time. Kalinda had land around her home, but she could never hope to save enough for the tools required to get started with subsistence farming. Food security, consistent availability of healthy food, is a problem all over the world. Subsistence farming, or farming for individual food needs, helps provide food security for poor families. In this moment of crisis, Kalinda did not have family to turn to. Her parents were also very poor and could not help. Raising families of their own, Kalinda's siblings could not take the extra burden of having to provide for her and her children. Her in-laws were too old to work to support their grandchildren—they needed to be cared for themselves. Kalinda came from a poor family, married into a poor family and lost her only means of support when her husband died. But as brokenness threatened to engulf Kalinda, something else wrestled to the surface in her heart: determination. Finding a daily wage job, Kalinda began cleaning the house and caring for the cattle of a local family. She worked hard to scrape together enough earnings for food and education for her children. Kalinda's elderly parents-in-law, who were too frail to work, also relied on her earnings. Every night, Kalinda found herself exhausted. The burden of providing for the family was too much. The land around Kalinda's home lay barren in the absence of anyone to work it. As she cared for someone else's house and animals, her own were left neglected. Weary years passed for Kalinda's family as they eked out a life together. Then another moment of crisis for the battered family came: Kalinda's oldest daughter, Mala, was afflicted by evil spirits. Mala spent each night in fear, keeping the whole family awake with screams of terror. For months, Mala suffered through disturbed nights. Kalinda could not afford the special rituals required by their traditional religion to deliver her daughter; the basic needs of the family swallowed all her income. Kalinda felt helpless and trapped. While the family lived through these nights of torment and fear, one day they met a GFA-supported pastor named Kulveer. Kalinda asked Pastor Kulveer to please pray for her daughter in Jesus' name. 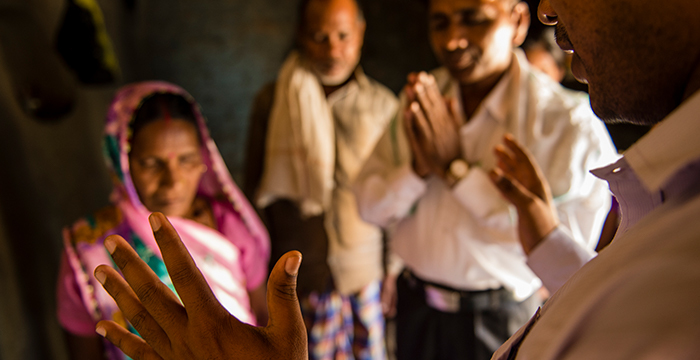 Pastor Kulveer prayed for Mala and encouraged the family to trust Jesus to rescue her. All over Asia, many people are experiencing the power of prayer and encountering a God who loves them. Kalinda brought Mala to Pastor Kulveer's church for more prayer. As the congregation lifted Mala up to the Lord, along with Kalinda and the rest of the family, He heard their prayers, and Mala was released from her torment. The family was astonished that God worked so quickly to bring Mala relief. Kalinda and her family began to attend Pastor Kulveer's worship services to praise the God who rescued Mala. As the pastor got to know the family, he saw hardships that came from not having a father or husband to provide for Kalinda's children and in-laws. He knew this struggling family had land, and they lacked the tools to work it. Filled with compassion, Pastor Kulveer prayed for a way he could help. Wanting to lighten the financial burden of the widow, Pastor Kulveer looked for a practical gift to help the struggling family. Through gifts of farm tools and cattle, families like Kalinda's can cultivate their own land to provide food through subsistence farming. With subsistence farming helping with daily food needs, income is freed up for education and medical expenses. Kalinda was overwhelmed with joy the day she received a water buffalo from a Christmas gift distribution arranged by Pastor Kulveer. It was the perfect "tool" to transform their barren land into a verdant garden. Thankfulness filled her heart as she and her family brought the water buffalo home. They built a shelter for their buffalo, and Kalinda's family cared for it like a new member of the family—a family that was growing! Within a few months, the water buffalo gave birth to a calf. The family was now able to get milk from the mother. They had enough milk to supply their own needs and a surplus they could sell for extra income. 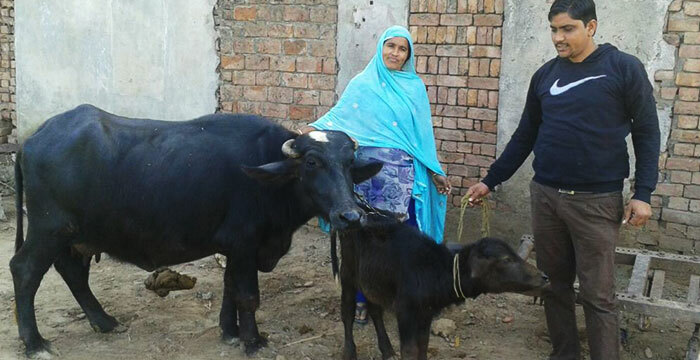 Pastor Kulveer with Kalinda and the newest member of her family—a water buffalo. A few months after bringing her water buffalo home, it gave birth to a calf! As the calf grew, Mala and her siblings were able to start tilling their formerly barren land and grow produce for their daily meals. 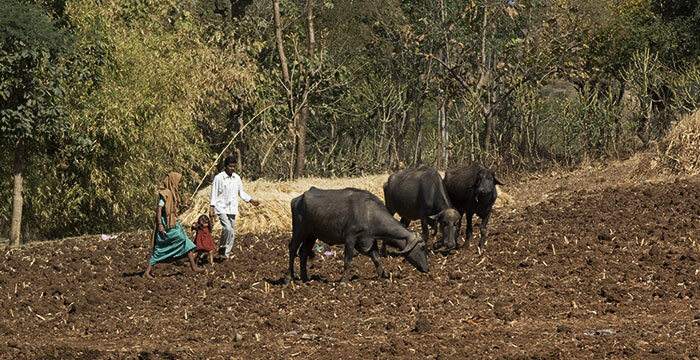 For this precious family, the gift of a water buffalo opened the doors to food security through subsistence farming. The impact of a water buffalo for this poor family was enormous. "If you had the opportunity to visit the mission field," shares Dr. K.P. Yohannan, founder of GFA, "there would be thousands of people you could meet whose lives have been touched by gifts such as chickens, goats and rickshaws. These unlikely gifts brought them a means of income they most likely never could have gained otherwise. Recipients of these gifts are finding hope, both in this world and in the love of Christ." Subsistence farming can be a safety net for families by providing a reliable source of food. For families like Kalinda's, this relieved a huge financial weight. A water buffalo is like a savings account on four legs. With the financial burden eased, Kalinda can work joyfully for her employer, knowing there will be enough food at home. She does not have to worry about the future. Every other year a new calf is born, which is almost like a savings account on four legs. Each calf can be sold for around $220—a substantial amount for a poor family in Asia! Animal gifts, such as a water buffalo, provide for families in a variety of ways. They provide milk for the families to drink and sell. The animals till the fields for crops to be grown and can be rented out for neighbors to use. Water buffalo also give birth every two years, essentially adding to a family's savings as the herd grows. Gifting a water buffalo is giving a stable future to families otherwise crushed in times of crisis. We all experience hardships in life, but most of us have the financial resources to weather the storms. Just as we recently celebrated Jesus, born in a stable, give a gift from the stable to a needy family in Asia.